Motto of County Council: ? 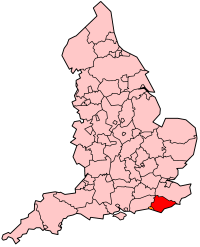 East Sussex is a county created on 1 April 1974. It is in South East England. It is bordered by the counties of Kent, Surrey and West Sussex, and to the south by the English Channel. This page was last changed on 3 July 2018, at 03:29.